Infinite Dreams has ported their 2006 mobile game Sky Force Reloaded to the iPhone [App Store]. This vertical shoot ’em up apparently received rave reviews during its original release, and the iPhone version seems to live up to the reputation. The game is a traditional vertical arcade shooter in which you must battle across eight different levels culminating in a boss-battle at the end of each. 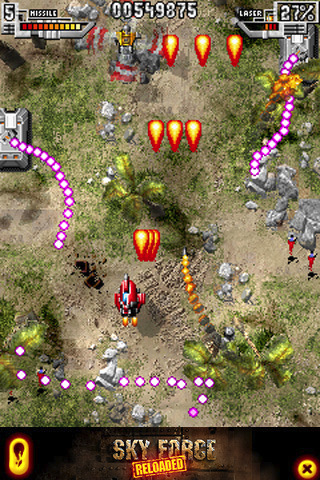 The game offers a variety of pickups and powerups along the way. Sky Force Reloaded feels like a real arcade shooter. In contrast, many of the existing iPhone shooters have felt more like glorified tech demos without enough attention placed on gameplay balance. Sky Force Reloaded also offers 3 different difficulty levels (easy, medium and hard) and 3 different ships to choose from. Ships range from slower/more shields to faster/less shields. The developers opted (thankfully) to use touch-controls for ship movement. While it’s still no replacement for a joystick, their implementation is quite reasonable. Sliding your finger around the screen results in ship movements slightly offset above your finger. The ship’s movements, however, have a certain lag/heaviness to it which feels appropriate and allows you to dodge enemy fire in a somewhat natural way by sliding your finger around the screen. This video shows the gameplay across the first three levels. In the video it appears that the finger is covering up the ship, but in practice it’s not as big a problem. The game is currently selling for a $0.99 “limited time" price. At that price, we certainly recommend this game which offers the best vertical shooter experience on the iPhone. Previous PostPrevious DanceDanceRevolution Finally Available in the U.S.